Misty Katterhagen is an artist, cake is her medium and her business, Mimi’s Cakes and Bakes, is a masterpiece in the making. Misty Katterhagen grew up with a well-stocked kitchen, a local-loving father and a mother whose Christmas dessert trays belonged in a Martha Stewart magazine. With the proper tools and ingredients at her fingertips and culinary know-how in her blood, it's no wonder she followed her love for experimentation (and desserts) to the Bonnie Gordon College of Confectionary Arts and eventually, to the birth of her own business, Mimi's Cakes and Bakes. But the icing on Katterhagen's cake making abilities is her creativity. Gathering inspirations from the places around that world that she's seen, and tasted, the Enfield-based cake boss' creations don't just look imaginative, they taste that way too. " I've made it my mission to scrutinize and admire as many techniques and traditions as possible in markets, cafes and pastry shops in every country I visit," says Katterhagen, who opened up Mimi's Cakes and Bakes out of her home about three years ago. "My flavours menu was created with my travels in mind, these memories add a personal touch to my offerings and allow my customers to experience just a little taste of what I love." Some of her much-loved inspirations include coffee and meringues out of Panama, Paris' signature macarons, the Italian dessert biscuit riciarelli and Venezuelan chocolate. "My almond comfort cake is enhanced with candied orange peel in silky buttercream and reminds me of the chewy riciarelli that has been a Tuscan treat since the 14th century." 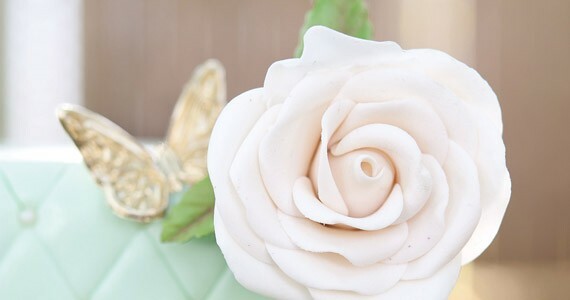 During peak wedding season, Mimi's Cakes and Bakes is kept busy creating custom cakes, spending anywhere from 20 to 70 hours perfecting stunning designs. Seriously, they're edible artwork. 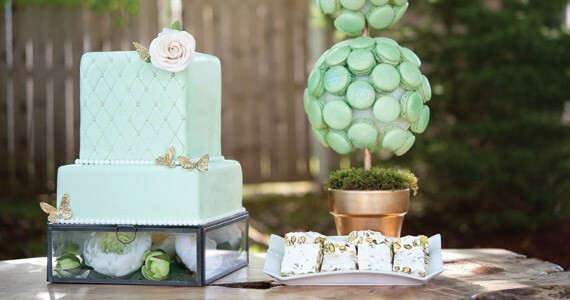 "The cake is a display of personal style and a gesture of gratitude from the bride and groom to the people who surround and support them on one of the biggest days of their lives," says Katterhagen, who encourages brides to come to their cake consultation with photos of their ideas and inspirations. 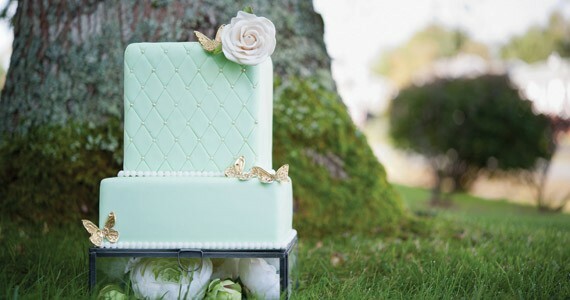 Though fads in the wedding industry are ever-changing and evolving, she keeps her sticky fingers on the pulse of cake style. For 2013, she predicts pale colours, specifically a sweet, but muted mint (like the in the custom creation pictured to the left). "Flowers are becoming more abstract and shape is anything you can imagine," says Katterhagen. "I also see a trend towards unique confections being offered to compliment the main cake. " That means (with any luck) macarons, nougat and meringues will be popping up on a dessert table near you.